Just a quick post this in case you heard me* on BBC Radio Devon on Friday (15th Nov) and wanted a note of the beers we tasted on air. I decided to bring in a few dark beers for the coming cold months. We started with: Brains Dark (4.1%) – a delicious dark mild that those who know me will be familiar with me raving on about. Brewed in Cardiff since the 1940s this rich chocolatey-coffee flavoured brew has a lovely tangy aftertaste. Next up: Exeter Brewery Darkness (5.1%) – a rich, full bodied but refreshing stout that Beer Husband normally swigs before I get a chance to! 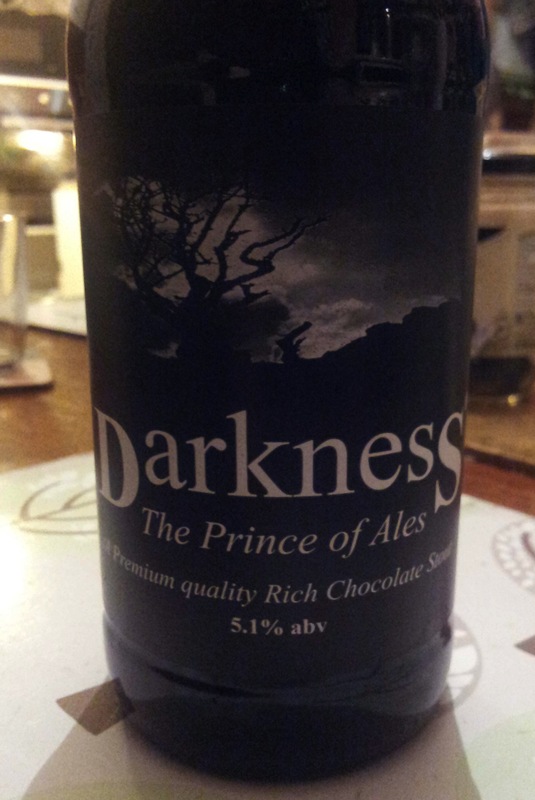 Exeter Brewery Darkness – a fine example of a stout. Finally: Moor Beer Illusion (4.7%) – a powerfully hopped black IPA with a blackcurrant leaf aroma and an almost raspberry zestiness to it. I could have filled the whole show with dark beers to be honest. My other favourites include Williams Bros Profanity Stout (7%); Brooklyn Brewery Black Chocolate Stout (10%); Flying Dog Gonzo Imperial Porter (9.2%) and although I loathe the labelling for the way it uses images of women to sell beer, Wye Valley Dorothy Goodbody’s Wholesome Stout (4.6%). What are your favourite dark beers? *If you missed me, you can find the show on Listen Again here for about one week after it was broadcast. I was on for the last hour of the programme. Thanks for the recommendations, sorry missed the programme here in Somerset. Followed up on your recommendation from the Eden Project beer tasting, to try Tyskie. Will particularly look out for Illusion from our area. Just picked up Quantock’s Plastered Pheasant and Rocking Robin from the Taunton Christmas Market. A good time for winter ales. I will be brewing 5 gal of Old Sussex Ale (ex King & Barnes) shortly.